In an increasingly complex and disruptive retail landscape, retailers and suppliers clearly need to adapt. But how? Knowing where best to deploy resources will separate best-in-class companies from the rest of the pack. 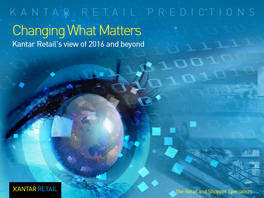 Changing What Matters examines the key global trends that are likely to have a significant impact on retailing in 2016 and beyond. These trends include those that have been unfolding for some time as well as those that will eventually have a greater impact than it may appear today. What matters to your shoppers, trading partners, and shareholders/owners is shifting; the work required to win won’t just be faster and cheaper, but harder and different. Against this backdrop, this critical piece of thought leadership includes practical frameworks that can help you win in three key areas — stores, shoppers, and plans — and focus on the new things that matter. Please contact us if you would like to discuss the specific implications for your organization.